R.I.P., Edward Hardwicke (1932-2011). Here's the announcement in The Stage. Aww, how sad. 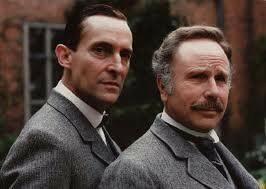 The two of them will always be Holmes and Watson to me; they were both perfect. Each was wonderful on his own, but together, they just fit, didn't they? They did. It's rare for actors to have such a rapport with each other and their characters. I am such a Watson fan, and he was truly my favorite. I'm sorry to hear of his passing. Awww, I grew up with both these and the Basil Rathbone/Nigel Bruce versions. Sadness. Sad news indeed. :( My favorite Watson. Rest in Peace, Mr. Hardwicke. Two of the very best, long may they reign. Now I am really bummed. So sorry to hear that! Those two will always be my Sherlock and Watson. I'm sorry, too. :( At least they're reunited now. This is very sad news. He was my favorite Watson. One of the first portrayals of Watson which didn't give the impression that he got his degree from some unaccredited diploma mill. That is so hard to hear... He was *MY* Watson. An era has ended.